In 1980, the U.S. Congress enacted the Comprehensive Environmental Response, Compensation, and Liability Act, designed to clean up sites contaminated with hazardous substances. This program is what is known by the common name of Superfund. Using a number of criteria, the EPA assigns a hazard score to each site, and those above the designated threshold are assigned to the National Priorities List (NPL) for clean up. The NPL sites are what we commonly call Superfund sites. I first reported on NPL sites in February, 2013. This post updates the information. 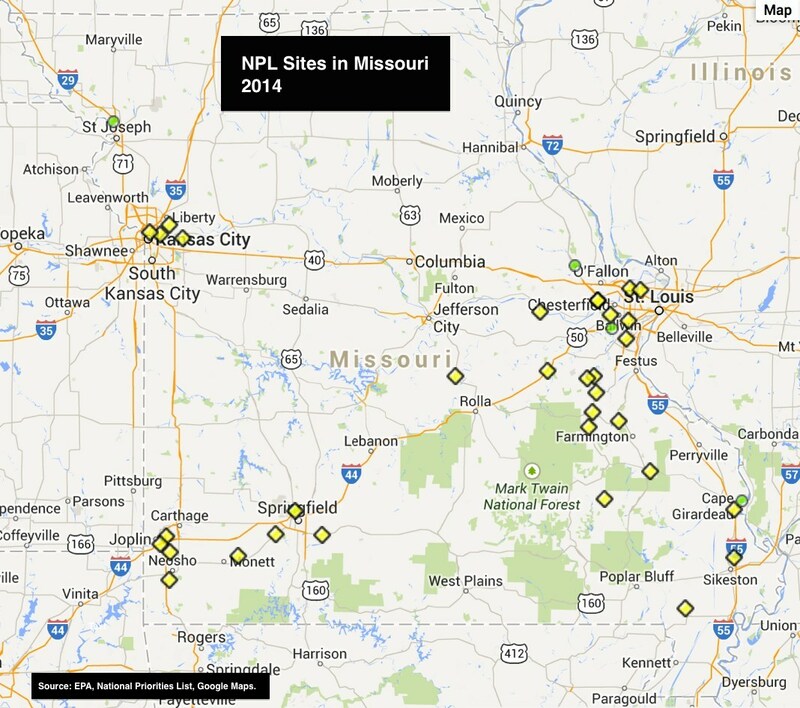 The number of NPL sites in Missouri and several other states are given in the table at right. Some of the sites are mine sites, but others represent contamination by industrial or agricultural chemicals and pollutants. 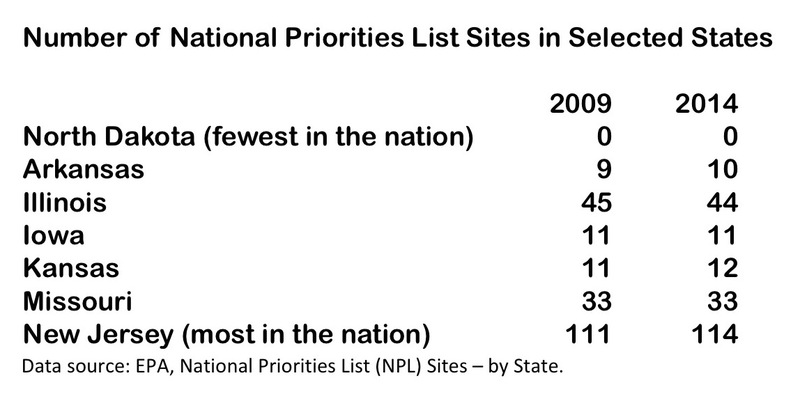 Between 2009 and 2014, the number of sites North Dakota, Iowa, and Missouri stayed the same. IIllinois and Kansas each had one site removed from the list, while New Jersey had 3 sites added. The map at right shows the location of the sites in Missouri. Yellow diamonds are sites on the NPL. Green circles are sites that were on the list, but have been removed. The sites cluster around St. Louis, Kansas City, Springfield, Joplin, and the Lead Belt mining region. In many cases, the contaminated land cannot be reclaimed. Rather, it must be removed and placed in a structure designed to prevent the contamination from escaping for a very long time. Because of discrepancies between data sources, a precise count of completed work cannot be provided here. Information about specific sites can be found at the EPA National Priorities List website, and also in the 2013 Missouri Registry Annual Report published by the Missouri Department of Natural Resources. Map: NPL Map Using Google Maps, http://www.epa.gov/superfund/sites/query/queryhtm/nplmapsg.htm. Missouri Department of Conservation. 2013. Missouri Registry Annual Report, 2013. http://www.dnr.mo.gov/env/hwp/sfund/sfundregistry.htm. By mogreenstats in Land, Pollution - Land on 2014/08/07 .